Dmitry Starodubov, Fiber Optics Manufacturing in Space, FOMS Inc.
Peter Hasbrook, NASA JSC; and Liz Warren, ISS National Lab/NASA JSC. The conference began with introductory statements by Peter Hasbrook and Liz Warren on the benefits of science experiments conducted in space. One announcement of note is that the book ISS Benefits for Humanity has just been re-released in its third edition with updated information. As a NASA Publication, it is available online in PDF form for free. Several websites are name-dropped, including ISS National Lab, where information about experiments run onboard the International Space Station (ISS) can be found. NASA operates a wide selection of websites offering the importance of spaceflight in the advancement of cost-effective technology and life-saving experiments. Maria Bualat, Astrobee, NASA Ames. Maria Bualat presented the new Astrobees being launched on NG-11. Astrobees are autonomous robots that fly inside the ISS performing various tasks and experiments. They are battery-powered, and use three processors similar to those used in smartphones. The robots move by pulling air into 12 nozzles which can be opened and closed, allowing the robot to fly in any direction in the weightless environment. Each Astrobee has two experiment bays which can also carry tools, as well as a camera to allow ground controllers to use them without astronaut assistance. By using Astrobees, NASA can reduce the amount of time astronauts spend on housekeeping chores such as locating equipment, a particular task which the Astrobees’ RFID readers can perform more efficiently. The devices also have the ability to return to their charging stations when low on power. They can only be operated inside the ISS. Dmitry Starodubov spoke about FOMS, a new experiment that will test the manufacturing of fiber optic cables in microgravity. These specialty ZBLAN optical fibers have a high cost of production per kilometer, as well as a high purchase price. The microgravity environment of low-Earth orbit is expected to allow a massive investment return, with 1km of fiber costing about 0.4kg (1 lbs) of payload using a locker-sized machine, drastically lowering the cost of producing optical fibers. The applications for this experiment pertain primarily to defense and remote sensing, but also have commercial applications. Bob Twiggs, ThinSat, Twiggs Space Lab, Morehead State University; and Chris Hale, ThinSat, Virginia Space. 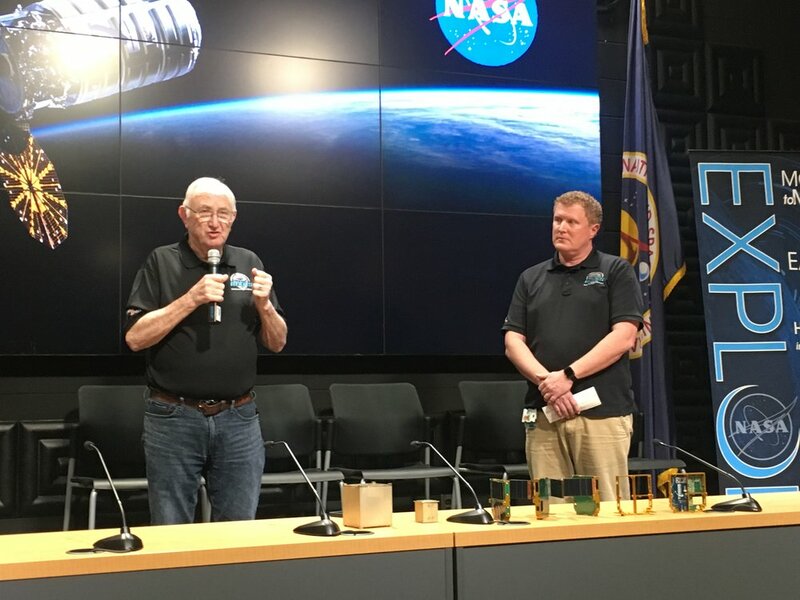 Bob Twiggs, co-inventor of the CubeSat, PocketSat, and ThinSat, and Chris Hale discussed Virginia Space’s ThinSat experiments, a series of 60 ThinSats carrying experiments sponsored by the Commonwealth of Virginia. The ThinSats will be transported to orbit on Antares’s avionics ring, not in the Cygnus spacecraft, being deployed between payload separation and solar array deployment on the launch timeline. These tiny satellites, the size of a slice of bread, carry a multiple experiments each, and are tethered via a small array of folding solar panels powering them. On NG-11, these satellites will be transported to ELEO (extreme low-Earth orbit). Typical of this type of satellite, many of the experiments were conceived, and are being conducted, by students, ranging from primary school (elementary) age through graduates, owing much to their accessibility and affordability compared to larger models of satellites. A ThinSat mockup. The upper, blue section of the satellite is devoted to student experiments. Data is downlinked back to Earth via the Globalstar network. Nina Nishiyama and Trisha Rettig, RRT-12, Loma Linda University. Nina Nishiyama and Trisha Rettig presented Rodent Research 12, in which 40 mice will launch to the ISS onboard the SS Roger Chaffee. Along with the control group on Earth, the mice will be subjected to a series of vaccinations to study immune system health. Their responses to the challenge of several vaccines will help indicate not only the effect of microgravity on immune health, but also give researchers new data on immune system response in general. Tissue samples will be taken from the mice 30 days into their spaceflight, and will return to Earth for further study. This will provide new information for long-duration spaceflight research, as well as for Earthbound applications like wheelchair and bed-bound patients. On this mission, many more experiments are going to the ISS. One of them is ACE-T-10, investigating the growth and microscopic behavior of crystalline structures in microgravity. The Canadian Space Agency (CSA)’s Bio-Analyzer, the size of a gaming console, will study blood, saliva, and urine samples on-orbit. OCO-3 will study Earth’s carbon cycle. A new weather experiment will use microwaves to explore other ways of detecting weather patterns. These are just some of the other experiments flying on NG-11. One piece of technical hardware that will fly is the RELL, the Robotic External Leak Locator. This device, attached to the station’s robotic arm, can detect and repair leaks from the ISS using a mass spectrometer and pressure sensor. This device has previously detected and repaired ammonia leaks on the station. As shown by this re-supply mission, as well as all recent spaceflight, there has never been a better time for students and researchers of all disciplines to become involved in space science. Liz Warren highlighted an important aspect of these projects for the researchers themselves: interacting with multi-disciplinary elements. In order to fly an experiment in space, the new operating constraints, cooperations, and partnerships increase one’s interaction with other aspects of their fields. Cover Image - A mockup of the RELL. The pressure sensor is housed in the left cylinder, and the mass spectrometer in the top cylinder. The robot arm attaches to the back of the device.